The RP Photonics Buyer's Guide contains 15 suppliers for quantum cascade lasers. 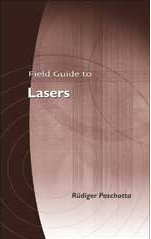 Ask RP Photonics for advice concerning various kinds of semiconductor lasers. The quantum cascade laser is a special kind of semiconductor laser, usually emitting mid-infrared light. Such a laser operates on laser transitions not between different electronic bands but on intersubband transitions of a semiconductor structure. Figure 1 shows what happens to an electron injected into the gain region: in each period of the structure, it undergoes a first transition (blue arrow) between two sublevels of a quantum well (which is the laser transition on which stimulated emission occurs), then a non-radiative transition (red arrow) to the lowest sublevel, before tunneling (gray arrow) into the upper level of the next quantum well. By using several tens or even 100 quantum wells in a series (a cascade), a higher optical gain and multiple photons per electron are obtained at the expense of a higher required electrical voltage. 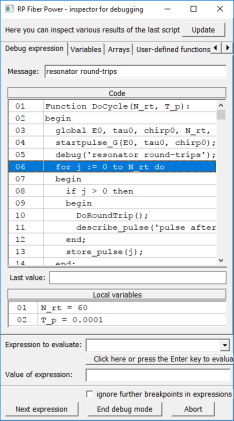 The operation voltage can easily be of the order of 10 V, whereas few volts are sufficient for ordinary laser diodes. Figure 1: Strongly simplified schematic of the gain region of a quantum cascade laser. The diagram shows the electron energy versus position in the structure, which contains three quantum wells. The overall downward trend of energy towards the right-hand side is caused by an applied electric field. In reality, each gain region must be divided into an active region and an injector. As the transition energies are defined not by fixed material properties but rather by design parameters (particularly by layer thickness values of quantum wells), quantum cascade lasers can be designed for operating wavelengths ranging from a few microns to well above 10 μm, or even in the terahertz region. 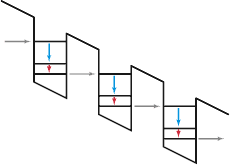 In a quantum cascade laser, the mentioned quantum well structure is embedded in a waveguide, and the laser resonator is mostly of DBR or DFB type. There are also external-cavity lasers, where a wavelength tuning element such as a diffraction grating is part of the resonator. Whereas continuously operating room-temperature devices  are normally limited to moderate output power levels in the milliwatt region (although more than a watt is possible), multiple watts are easily possible with liquid-nitrogen cooling. Even at room temperature, watt-level peak powers are possible when using short pump pulses. The power conversion efficiency of quantum cascade lasers is typically of the order of a few tens of percent. Recently, however, devices with efficiencies around 50% have been demonstrated [9, 10], although only for cryogenic operation conditions. Most quantum cascade lasers emit mid-infrared light. However, quantum cascade lasers can also be made for generating terahertz waves. Such devices constitute very compact and simple sources of terahertz radiation. Recently, even room temperature terahertz generation has been achieved via internal difference frequency generation . Perhaps the most important applications for quantum cascade lasers will be in the area of laser absorption spectroscopy of trace gases, e.g. for detecting very small concentrations of pollutants in air. In addition to the suitable wavelength range, QCLs usually feature a relatively narrow linewidth and good wavelength tunability, making them very suitable for such applications.